When you choose The Orchard for your San Francisco stay, you’ll find yourself just minutes from some of the city’s most popular attractions. 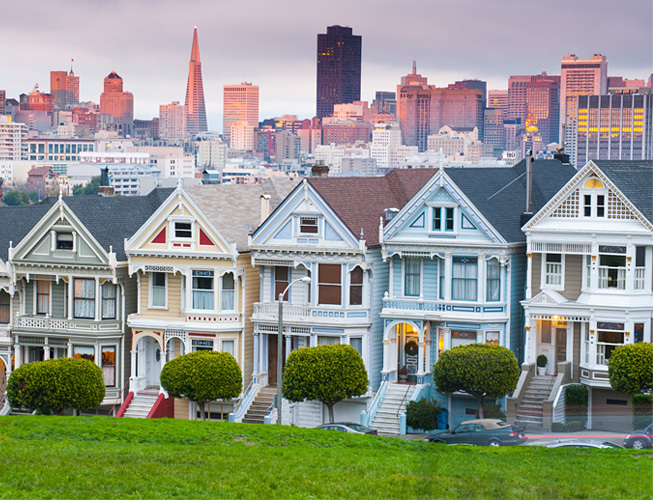 Here, we share a few of our favorite “must see” sights, including Fisherman’s Wharf, Lombard Street and The Presidio. Of course no trip to San Francisco is complete without a ride on a historic cable car. Since 1873, the historic San Francisco cable cars have shuttled tourists and locals throughout the city - from Nob Hill to the Financial District and Fisherman’s Wharf. 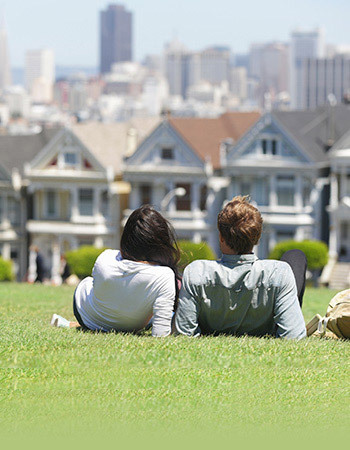 Ride to your favorite neighborhoods and attractions on one of the most famous landmarks of San Francisco. You can hop on the historic cable car just outside the hotel and see all the sights, sounds and attractions around us. 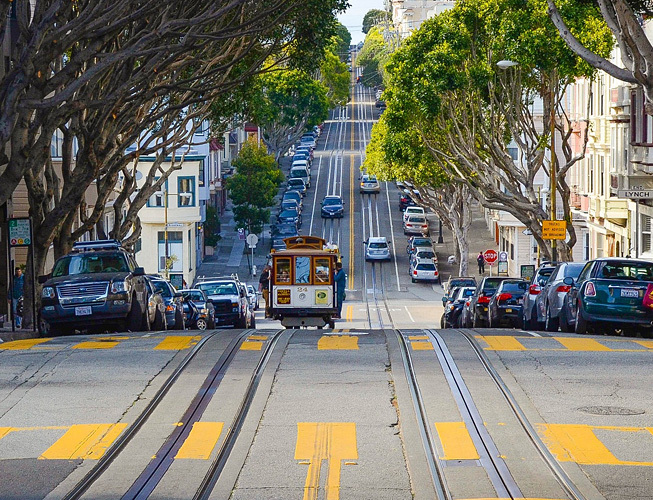 Purchase a one-day, three-day, or seven-day Passport so that you can ride on the streetcars, buses, and cable cars to anywhere you wish to explore. Downtown San Francisco’s landmark park and shopping destination, Union Square features fashionable shopping, a vibrant theater district, and exceptional dining. The shopping mecca of San Francisco, Union Square is home to the finest department stores, specialty shops, boutiques and restaurants in California, sporting every major haute couture, jewelry and department store you can imagine. 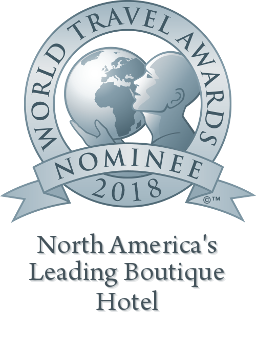 Surrounding the park square, you’ll find department stores like Nordstrom, Macy's, Neiman-Marcus, Saks Fifth Avenue, and well as trendy boutiques and superstores. Walk streets lined with fine art galleries, see a show at one of the many theatres or dine at the trendiest restaurants in the city. 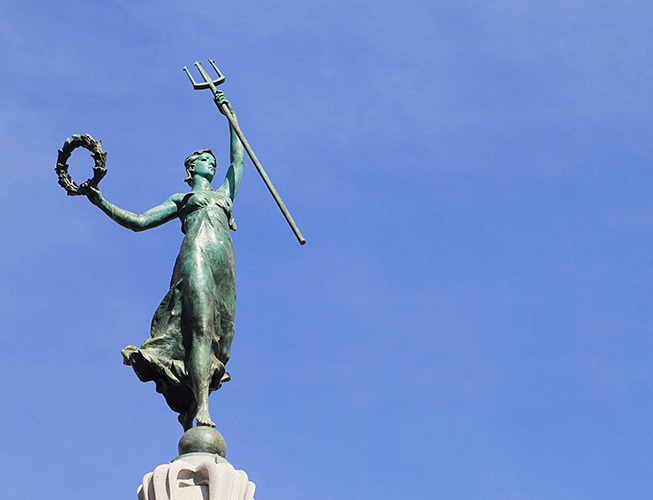 Union Square is also a beautiful piazza with a monument of the goddess Victory, granite plazas, a terraced stage, light sculptures designed by artist R.M. Fischer, cafés, and four grand entrances bordered by palms that punctuate the history and beauty of San Francisco. The plaza presents many events, art and fashion shows, and parties. Hop on the cable cars that depart from Union Square or join a walking tour. San Francisco’s historic waterfront attraction, Fisherman’s Wharf is a lively marketplace filled with activities and breathtaking Bay views. This favorite San Francisco destination is a coastal row of unique shopping, souvenir stores, seafood restaurants, vendors, Bay cruises, street performers, live music and a great fishing pier. 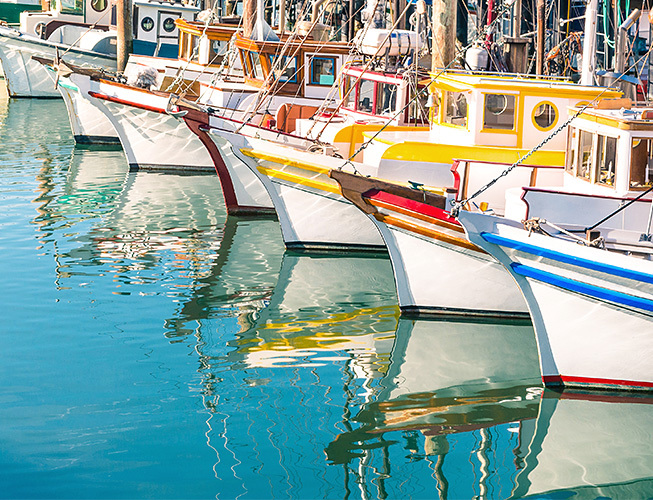 Waterfront marketplaces include: The Anchorage, The Cannery, Ghirardelli Square and the world-famous Pier 39, a festival marketplace with 110 shops, restaurants, performers, cruises, Aquarium of the Bay, and the loveable sea lions. Take the ferry from the Wharf or charter a sailboat to scenic Marin County. 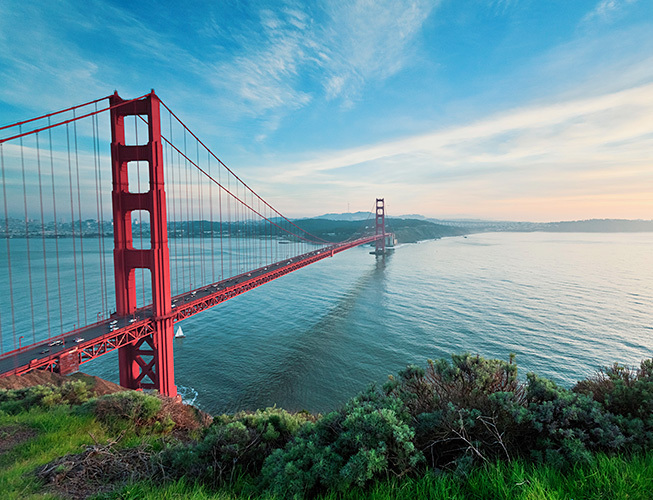 San Francisco’s grandest landmark and one of the most breathtaking structures in the world, the Golden Gate Bridge is the gateway where the Bay meets the Pacific Ocean and connects San Francisco to the Marin Headlands. Crossing under the iconic red towers of the 4,200-foot Golden Gate Bridge, experience magical views of the entire San Francisco Bay Area. Driving or biking across is a thrill, but a half-hour walk lets you absorb inspiring views. Unparalleled views of the Golden Gate Bridge are found at the beach at Crissy Field - a beautiful ‘green’ space with birds, joggers, and cyclists. Walk along the beach and tide pool for one mile, past volleyball fields and windsurfers until you are right under the Golden Gate Bridge. Crissy Field is one of the world's best beach locations for windsurfing and offers unparalleled views of the waterfront. The Presidio is a national park that preserves a complex cultural and natural heritage within its 1,480 acres south of the Golden Gate. 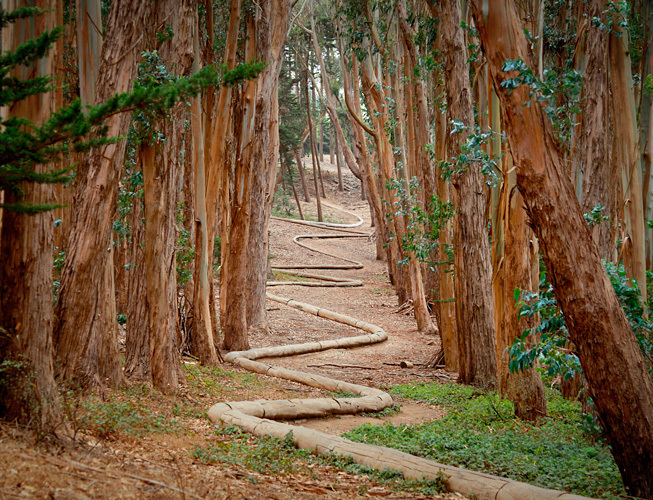 Once a U.S. Army post and site of the World’s Fair, The Presidio is part of the Golden Gate National Recreation Area, a recreational paradise with spectacular vistas, meandering trails, and historic and architectural treasures. Enjoy scenic hikes, fun walking tours, picnics, view an exhibit or take a stroll back in time. Enjoy the history and beauty of 500 historic buildings, coastal defense fortifications, a national cemetery, an historic airfield, a saltwater marsh, forests, beaches, plant habitats, coastal bluffs, and miles of hiking and biking trails with spectacular views. The park is open year-round. 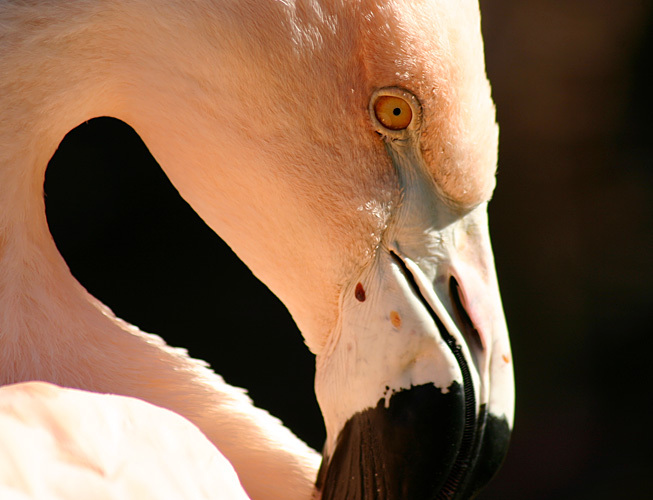 Northern California's largest zoological park and conservation center, historic San Francisco Zoo features more than 1,000 exotic and endangered wildlife. Set against the Pacific Ocean, this urban oasis is a naturalistic habitat for over 250 animal species, and offers many entertaining exhibits, activities and events. Visit the Grizzy Gulch, home to two grizzly bears, or stroll through the exciting African Savanna habitat. Experience the wonders of the Children's Zoo and the New Zoo, a conservation zoo dedicated to the preservation of wild places and wildlife. The entire family will enjoy thrilling exhibits such as Gorilla Preserve, Penguin Island, Koala Crossing, Lemur Forest and the Australian WalkAbout. Ride the historical Dentzel Carousel and Little Puffer miniature steam train. Open daily 10am-5pm. An innovative entertainment and technology marketplace, the Metreon is the first-of-its-kind entertainment venue. Located at Fourth and Mission streets in downtown San Francisco, this 350,000 square-foot complex features an eclectic mix of the Bay Area's most incredible restaurants, world-class shopping venues, 15 theatres, interactive attractions, family events and entertainment destinations, including the West Coast's largest IMAX theatre. 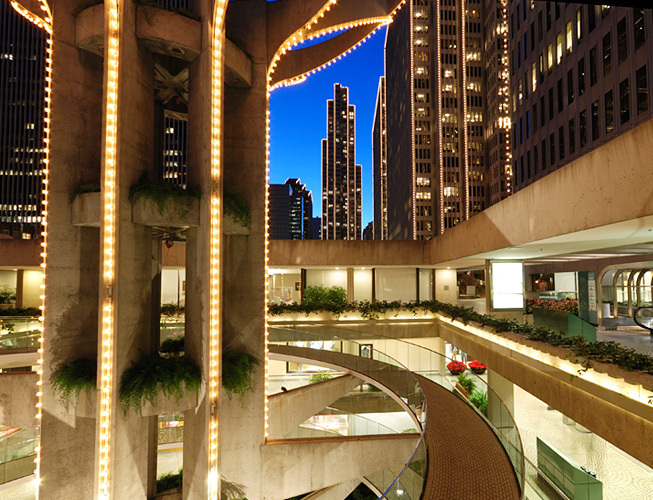 The 15-screen Loews Metreon is San Francisco’s largest movie complex with a panoramic view of Yerba Buena Gardens Esplanade and the downtown skyline. Designed by Swiss architect Mario Botta, SFMOMA houses an extensive collection of more than 25,000 works of modern and contemporary 20th Century art, including artistic developments in painting, sculpture, photography, architecture and design, and media arts that span the globe. Several art galleries display selections from the permanent collection of art, sculpture, furniture, and photographs along with changing exhibits. Experience the masterpieces of Henri Matisse, Frida Kahlo, René Magritte, Jackson Pollock, Georgia O'Keeffe, Man Ray, Andy Warhol, Ansel Adams, and Frank Lloyd Wright. SFMOMA also features a beautiful atrium lobby, a 299-seat theater, an interactive Education Center, the museum shop, Caffe Museo and the new 14,400-square-foot Rooftop Garden. One of the largest museums in the world, Asian Art Museum celebrates Asian art with a collection of 17,000 artworks spanning 6,000 years of history and seven regions. Located at the Civic Center, the technologically advanced museum showcases the material, aesthetic, and intellectual achievements of Asian art and culture. 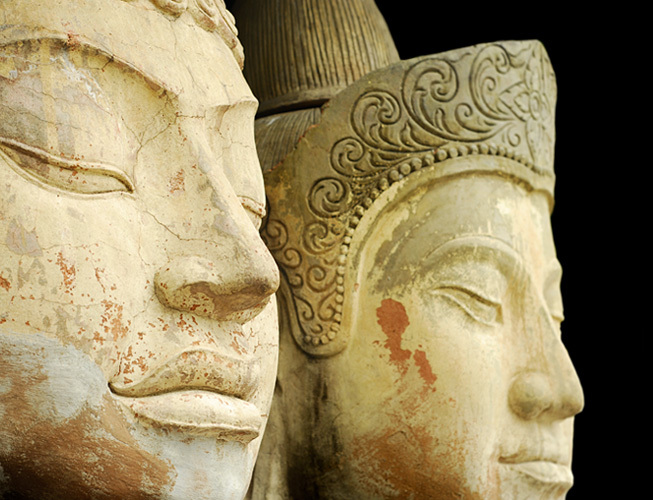 The Museum holds one of the most comprehensive collections of Asian art in the world with rare and exceptional objects. The collection includes thousands of objects ranging from tiny jades to monumental sculptures, paintings, porcelains, ceramics, lacquers, textiles, furniture, arms and armor, puppets, and basketry. One of the museum’s celebrated objects, the gilt bronze Buddha dating to the year 338 AD is the oldest known dated Chinese Buddha in the world and a noted example of Chinese Buddhist art. Visit the children’s discovery center and special rooms on African-American, Chinese, Filipino-American, and gay/lesbian works that surround the light-filled atrium. 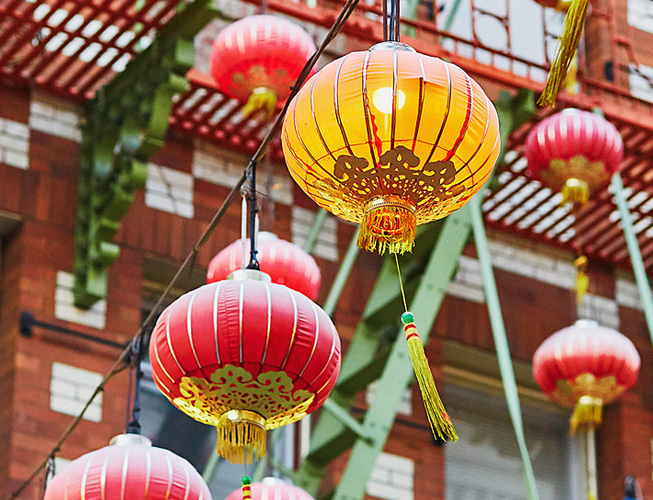 Experience the culture of the Orient at the unique restaurants, shops, markets, and bakeries in historic Chinatown, the largest Chinese community on the West Coast. Through the dragon-crested gate - a gift from China in 1969 - Chinatown’s 24-square blocks offers culturally-diverse stores, open markets and facades resembling shopping in Hong Kong. Stroll colorful streets to the elegant Chinese Presbyterian Church, Oakland Asian Cultural Center, and Pacific Renaissance Plaza, which houses shops and restaurants. Check out the restored Bank of Canton Building, Sing Chong Building, one of the first places rebuilt after the 1906 earthquake in San Francisco, Bank of America, decorated with gold dragons, Herbal Shop, and Old St. Mary’s, California's first cathedral. Walking tours guide you through Chinatown’s back alleys to authentic food markets and eateries. See artisans hand make crafts using ancient techniques. Uncover authentic crafts and pottery, antiques, musical instruments, Chinese cookware, and exotic Asian herbs and teas in secret alcoves. Delve into Chinese mysticism and culture as you explore the neighborhood’s sculpture and architecture. Enjoy Chinese cuisine and Dim Sum, a traditional Chinese brunch, at one of the oldest bakeries. Located in the urban core of Downtown San Francisco, Moscone Center (Moscone North, South and West) is San Francisco’s preeminent meeting, event, convention and exhibition venue. The Moscone Center features 700,000 square feet of exhibit space, six primary exhibit halls, 106 meeting rooms, 123,000 square feet of stylish pre-function lobbies, and houses a diverse collection of San Francisco's public art. Moscone also offers catering services, state-of the art audio/visual technology and a total digital network. 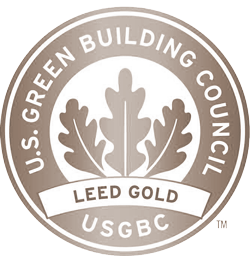 The Moscone Convention Center hosts many of the areas largest corporate events and has set the standards for efficiency and green initiatives. 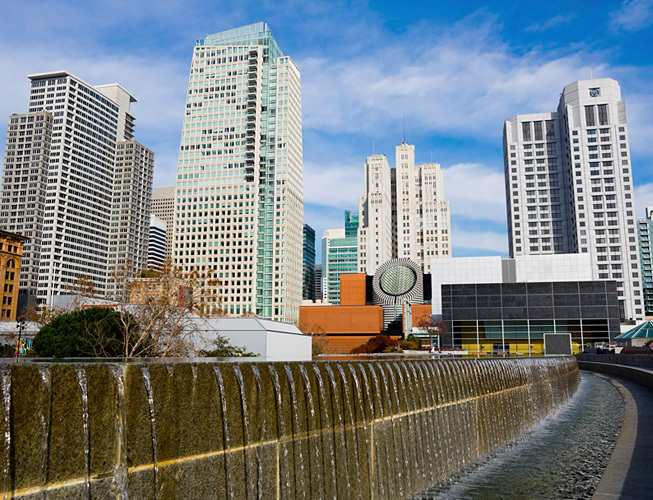 Covering one city block, and towering 110 feet above the street, the freestanding Moscone West anchors the 87-acre Yerba Buena Center district in a vibrant downtown neighborhood of theaters, restaurants, museums, galleries, and parks. 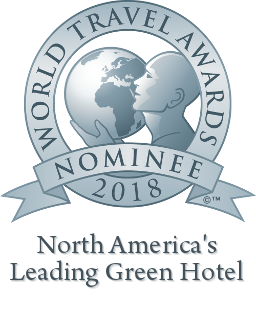 The Moscone Center, one of the busiest convention, trade and meetings facilities in the nation, now offers ‘green’ meetings with zero waste to lead the industry in environmentally friendly practices. The convention center is easily accessed by multiple forms of transportations and located near The Orchard Garden Hotel. If you are looking to host a smaller event, please contact our Sales Team so we can assist you in planning your event. Magnificent home of the Exploratorium, the Palace of Fine Arts was created as part of the 1915 Panama-Pacific International Exposition. 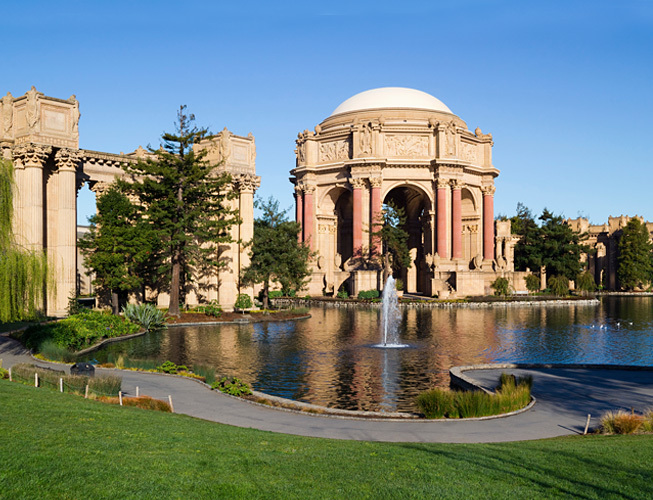 The Palace, designed as a "valentine for San Francisco" by renowned architect Bernard Maybeck, is an imposing structure featuring a classical Roman rotunda with curved colonnades in an idyllic park setting. The Palace holds art exhibitions, theater performances, events and has been the backdrop for many movies, such as Alfred Hitchcock's Vertigo. Enjoy a stroll by the lake, a romantic picnic, experience the ethereal beauty of the park and waterways, and visit the Exploratorium. Cruise through the cruel waters of San Francisco Bay to the rocky Island of Alcatraz, one of San Francisco’s most historic attractions. 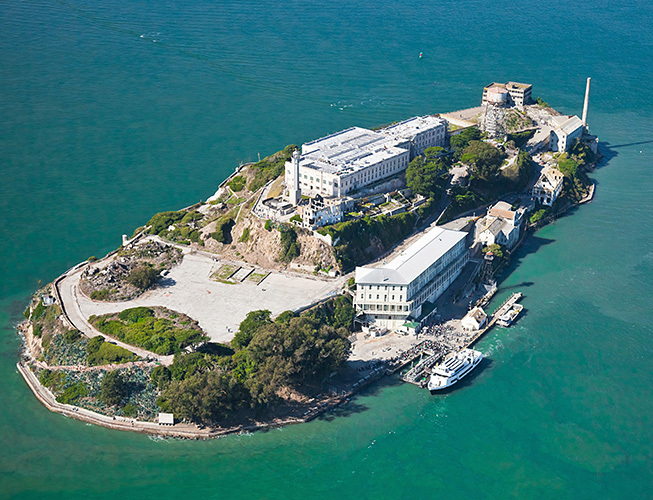 Formerly America's infamous maximum-security prison, sitting in the middle of San Francisco Bay, Alcatraz once held the country’s most notorious criminals including Al Capone. See “the rock” on one of the day or evening Alcatraz Tours departing from Pier 33 by ferry. You will experience a one-hour, self-guided tour of the mysterious abandoned prison and cell blocks enhanced with interesting audio commentary. You’ll even get to experience a minute locked in a darkened cell. Explore the remnants of the prison, and learn about the Native American occupation of 1969 - 1971, early military fortifications and the West Coast's first and oldest operating lighthouse. These structures and natural features - gardens, tide pools, bird colonies, and bay views - are incredibly preserved by the National Park Service. San Francisco’s “gay village” is home of the annual San Francisco Gay Pride Parade and the city's gay nightclubs, gay-friendly restaurants, shops and theaters. Bordered by Haight Ashbury, Noe Valley, Mission, and Twin Peaks, this vibrant neighborhood features unique shops, diverse restaurants, cafés, clubs, book and music stores, novelty stores, annual events and landmarks such as the Castro Theater and Harvey Milk Plaza. SF’s longest-running street fair, the Castro Street Fair entertains festive folk with music from four stages, arts and crafts, comedy, drag shows, food, and drink. 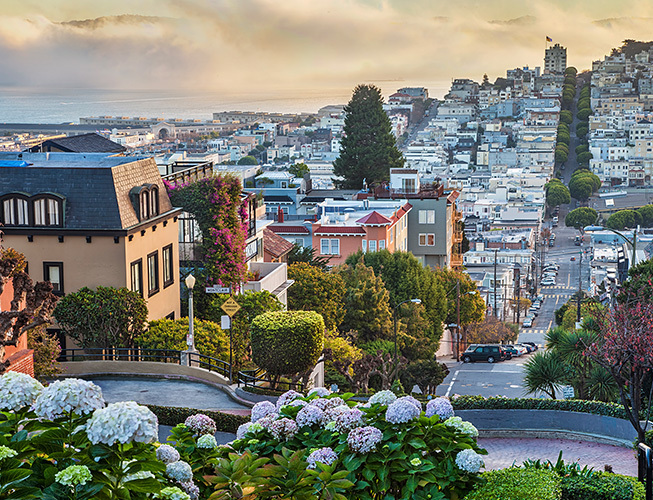 San Francisco’s twisty attraction, Lombard Street is known as America’s “crookedest street” because of its 8 sharp turns on a treacherous 40-degree slope. The steep, hilly street was created with sharp curves to switchback down the one-way hill past beautiful Victorian mansions. Lombard Street goes all the way up Telegraph Hill to Coit Tower and continues west down through the Marina to the Golden Gate Bridge. Paved with red bricks, the street is a beautiful sight. 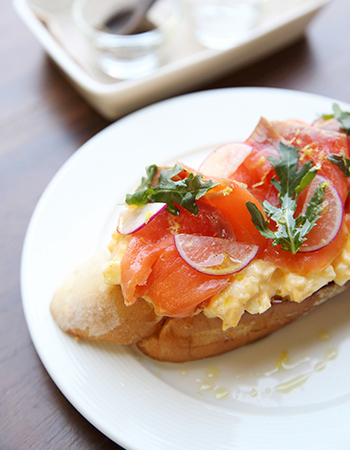 Enjoy a winding walk through the Russian Hill neighborhood past stately mansions. In the spring, Lombard St. is colorful with blooming chrysanthemums. 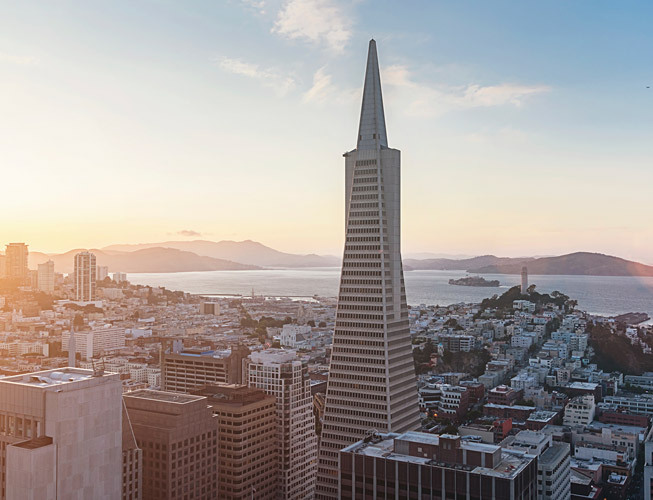 San Francisco's main central business district, the Financial District is home to major corporations, banks, law firms and other powerhouse players, as well as a half-dozen Fortune 500 companies.